Team building doesn’t happen in one session, it takes continual, coordinated efforts from the parents, coaches and players to foster an atmosphere of teamwork. 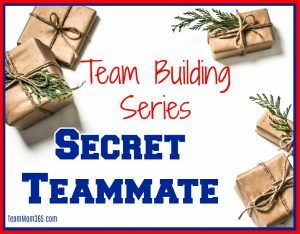 The next activity in our Team Building Series, Secret Teammate, is one of those effort which, unlike most team building activities, takes place throughout the entire season. Secret Teammate is a fun activity for all age groups where at each out-of-town or ‘big’ tournament (determined at the beginning of the season), the players give their ‘secret’ teammates an inspirational quote and a small gift. The quote is the highlight of this team building activity. 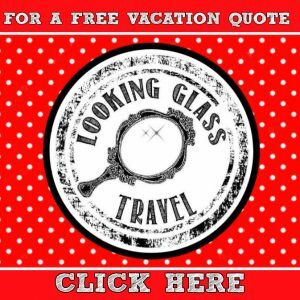 When selecting a quote, the giving player takes into consideration the receiving player. Is the receiving player in a slump and in need of a “pick me up”? If so, the giving player could pick an inspirational quote. Is the receiving player on a roll? If so, the giving player could pick a quote that encourages them to keep up the good work. The gift is the second element in the secret teammate gift. This gift should not be a big thing and should not be fretted over. Our teams have typically set a limit of $5 for each secret teammate gift. Your best place for gift ideas are discount stores such as Big Lots, Dollar General, Family Dollar or Dollar Tree. Determine which tournaments the players will be exchanging gifts. Get the supplies – The number of notecards and brown paper bags needed will be the number of players times the number of tournaments determined in Step 1. For example, if you have a softball team with 15 players and they are exchanging gifts at 5 tournaments you will need 75 of each (15 X 5 = 75). Each player fills out the questionnaire below. Players fold questionnaire and put it in a hat. The players then pull a name from the hat. This will be their secret teammate for the rest of the season. NOTE: If you want, you can choose a different player for each tournament. However, this gets to be a little labor intensive. On the other hand, by switching up the secret teammates you can accommodate for players who might not be able to make all the tournaments. Give each player their portfolio, index cards and brown paper bags for the number of tournaments secret teammate will be done. At each pre-selected tournament, the players bring their gift and quote in one of the brown paper bags with the name of their secret teammate written on the outside. They give it to the Team Mom. At a down moment or off game during the tournament, the coach will gather the players and pass out each bag and have them read their quote. This is a great opportunity for the coach to use the quotes as a teachable moment by possibly commenting on the quote if the situation warrants. At the end of the season, possibly at the very last tournament or if an after-season party is planned, the secret teammate will reveal themselves to their chosen teammate. Instead of a scheduled time for exchanging gifts, the player gives their secret teammate their gift secretly throughout the season. Placing it in the gym bag, on their car, locker, etc. If you are a school team with multiple levels such as Varsity, Junior Varsity and Freshman, to make sure there is true team unity, each player should pull the name of a player from a different team. This is a great way for the players to all get to know each other. 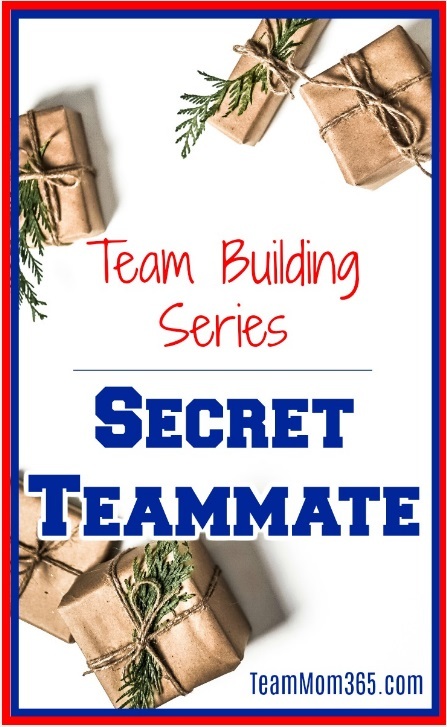 Secret Teammate will be a great team building activity for your group. It not only increases team bonding, it creates an atmosphere where the coaches can create teachable moments. Try it and let us know how it goes by tweeting us @TeamMom365.